It is mostly occupied by crops, prevalently citrus, above all at the lowest altitudes (about 0 – 500 m a.s.l.). These crops have replaced the pastiche, olive and carob scrub-forest that once occupied the lower flanks of the volcano. The rest of the natural vegetation is limited to the edges of the crops and the inhabited areas; among these, the Euphorbia (Euphorbia dendroides) is very significant. At higher altitudes (about 600 – 1000 m a.s.l. ), the vegetation was once characterized by the holly oak forests (Quercus ilex). Today, however, they have almost completely disappeared due to the human impact on the environment. Crops are very widespread, above all vines, olives, almonds and pistachio (on the western flank) and nut trees (on the north-eastern flank). The holly oak woods in some zones on the western flank are characterized by the presence of Oriental hackberry (Celtis tournefortil). Instead, on the eastern flank the woods are very fragmentary, and together with the holly oak, the flowering ash (Fraxinus ornus) and the European hop horn beam (Ostrya carpinifolia) can often be found. In some zones, between the holly oak woods, the Spanish chestnut (Castanea sativa) can also be seen. It is characterized by deciduous oak, above all by the pubescent oak (Quercus pubescens). However, the above mentioned woods are not uniformly distributed around the volcano and, in addition, they have largely been replaced by Spanish chestnut woods. In the zone of contrada Giarrita on the eastern flank, together with the pubescent oak there is the Adriatic oak (Quercus cerris). Above the pubescent oak and Spanish chestnut woods, there are those of Corsican pines (Pinus laricio) which in some places form splendid pine forests (Pinete of Linguaglossa and Serra La Nave). 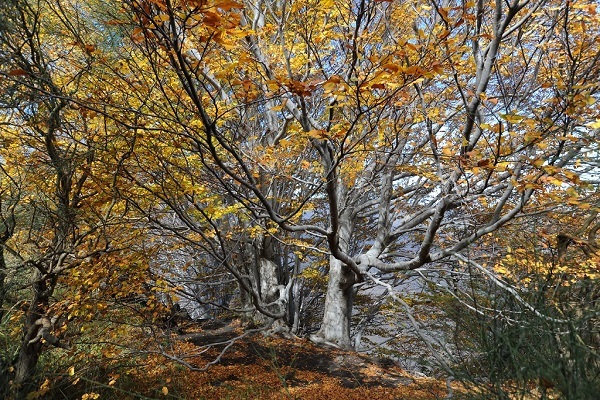 It extends until the upper limit of the woods; here European beech woods can be found (Fagus sylvatica), but they are very fragmentary and, in the drier zones, replaced by Corsican pine woods. 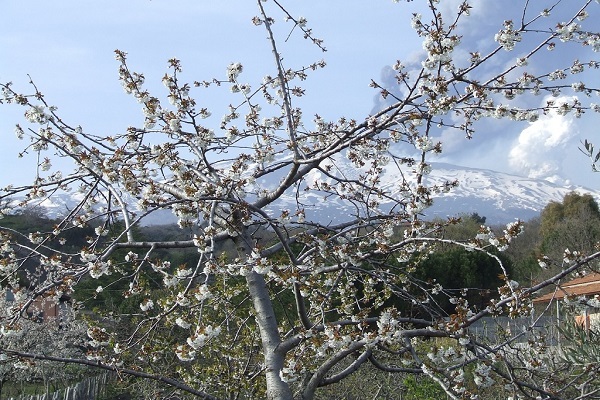 In some zones, particularly on the eastern flank, there are woods and scrub of Etnaq birch (Betulla aetnensis), a species considered by some authors as exclusive in Etna. 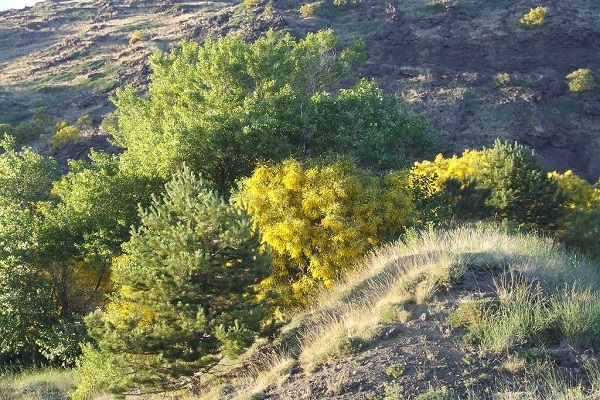 Another species very characteristic of the Etna landscape is the Etna wood waxen (Genista aetnensis), one of the most important colonizers of the lava flows. It extends above the wood vegetation where a characteristically low type of greenery is found, constituted by the Sicilian milk vetch (Astragalus siculus), which forms some typical thorny “pulvini”. 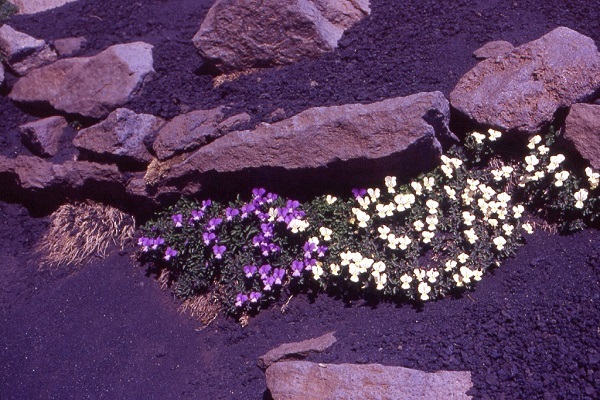 From 2.450 up to 3.000 m a.s.l, only few plants manage to survive, by adapting themselves to the difficult environmental conditions. They form a pioneer group characterized by the presence of Etna-type French sorrel (Rumex scutatus fo. Aetnensis). Above 3.000 m up to the summit craters there is the volcanic desert, since the continuous eruptive activity of the volcano prevents any form of vegetable life.